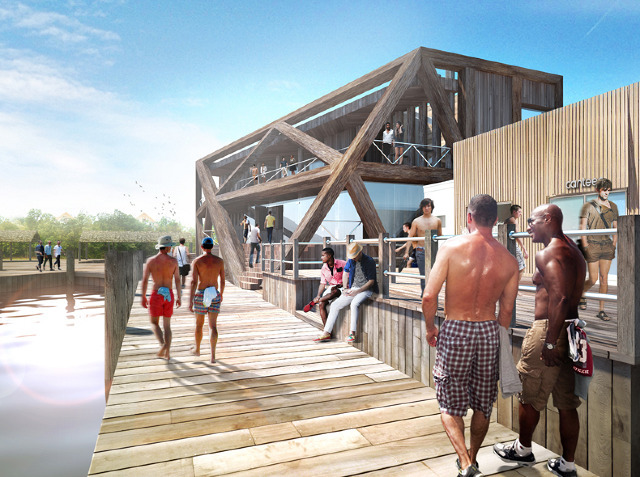 One thing I figured out about Fire Island right away: isolation costs more. A few short miles from Long Island, the sandbar known as Fire Island requires that any good consumed by a human being be brought in by ferry. That includes everything from fuel for hot water to chilled Bandol Rosé. This kind of glorious isolation can lead you to hit “empty,” a state that my fellow blogger Charlotte Moore talks about in a recent post (see http://thedailycure.wordpress.com/2012/08/06/day-9-the-heart-of-the-matter/). It will also empty your wallet. But for many of the summer inhabitants at the gay male end of Fire Island known as the Pines, the isolation leads to a desire for some of the action of home. Shed a few clothes, shed your inhibitions. There is one dusty, sandy, and sometimes (after a storm) muddy street called Fire Island Boulevard, used by access vehicles and the rare truck. Every other street is a narrow boardwalk winding through clusters of pine and bamboo. Housecleaners, repairmen, and delivery boys ride little Cushman scooters, but almost everybody walks at least a few miles a day on these endless planks that are always in a state of semi-disrepair. This is one of the greatest charms of the Pines. Just about every house feels like a secret compound. As soon as you board the jitney at the Sayville Train Station to take you to the ferry, you know this is a summer camp of some kind. The wild-eyed driver sports swimming trunks, a tank top, flip-flops, and tattoos, and he doesn’t bother with a seat belt. He turns up the volume on the disco beat, and everybody is ready to roll. After two days, most visitors to the island have been to all of the bars and hot spots. The restaurants are not memorable, but the Pines Pantry is surprisingly well stocked, given that it has a captive market. If you want to go out to dinner, you can catch a “water taxi” to Cherry Grove, which is similar to what we used to call an “E” ticket at Disneyland. After a few moments on the short journey, I was worried that our little boat would break into a thousand pieces. 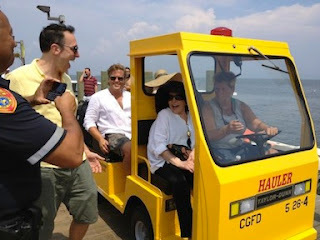 Liza Minelli in her "Lizamobile"
A day in the sun and the salt water makes guys out here randier than usual. Since Fire Island is so absurdly expensive, older men, who may be bald and chubby, are quite common and even welcome. (Although at the “shareathons” that take place each year in New York City, some people with a lease freely state that they don’t want “fatties.”) Younger men are willing to take 1/16th of a 1/8th share and share a room with somebody they barely know. Or they attach themselves to older prosperous men. The natural environs where men seek each other out have been described in great detail several times in queer literature of yore so I won’t go into that. One topic of conversation was whether Grindr would kill the turf between Cherry Grove and The Pines. Seems unlikely. While all the testosterone informs a lot of fantasies and realities, there are also numerous couples and other folks who are just looking to find that quiet empty, the isolation that was the original draw. For them, discos, drugs, and multiple hook-ups are history. The area around the ferry landing does feel like a flashback to the late 1970s and early 1980s to us middle-aged folk. But then the weekend ends and the temperature drops. Even the waves got calmer. For me, the “empty” has something to do with the temporal nature of the place. As soon as someone finishes a multimillion dollar house here, it begins to disintegrate. The salt, rain, and bugs devour these wood boardwalks and beautiful modernist homes. When everything is closed for the winter, the storms come and occasionally take a house or two away, and according to some reports, are taking the island itself away. Last winter, the famous Pavilion dance club burned to the ground. By next summer, a new one by architectural firm HWKN should be up, and there will be another place to celebrate “tea.” When everything quiets down, you hear the cicadas, birds, an occasional vehicle, a distant boat, and then a sound like trains on the track. But there is no train here. That sound is the bouncing of roller bags as somebody walks to the ferry to return home. This spit is 31 miles long and somewhere between 520 and 1,300 feet wide. It can’t last. But for a few days, it’s bliss.